Last weekend, we checked in at Hilton Mangaf last weekend. Can you believe its actually my first time there! I must be the only Kuwaiti! We got the chalet by the garden, ground floor, with 2 bedooms. Let me say I was so disappointed with their rooms. It was obvious they were badly used and not taken care off. And the doors and cupboards when opened were so damn noisy! We didn't care though, we had so much fun we forgot to do a lot of things. Barbeque was on our dinner menu. I brought my disposable one I got from Sultan Center a year ago. Hadn't had the chance to use it yet, since I have my own Weber grill which I adore. Another girl brought her cute portable griller. It was tiny but efficient. She also was in charge of the meat. We gave everyone tasks for food and stuff. The things we brought, even though I told them over and over again not to bring lots of food, because some of us didn't want to eat that much, was so excessive we had to give most of it away to the cleaners in the street. Enjoyed reading the post! Sounds like a blast- and I'm super jealous ;P The pictures of the rooms and living room look pretty decent- I was expecting much worse from your shar7 ;P Shakly baqalidkom. 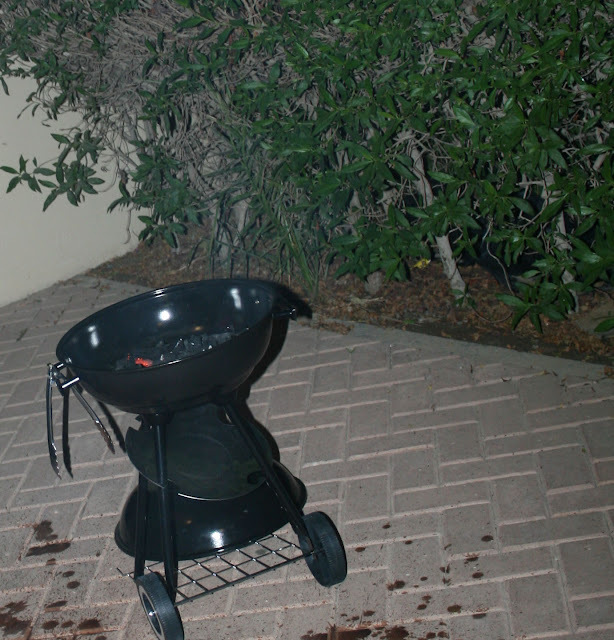 Oh and that disposable grill- we used it once bilshalai and we stupidly put it ontop of a glass table and it shattered and it "kinda" went up in flames. Talk about stupid.. Also, I agree with Hilton's breakfast. Its pretty good. Allah sounds fun! I'm glad you had a good time,Well to me Hilton didn't quite reach the level madre shloun 5 star hotel! Try movenpick bidi3 next time!Wonderful hotel our sleepovers kela eb movenpick jad iwanes! 7aneen LOOOL! fire and glass do not go well together! hehe at least u learnt that the hard way;p next time on the floor or same way we had..in real life the furniture looks "mustalak" thats the exact word we used for it;p pictures look better..the bathroom sucked also although I loved the spacious walk in shower! even sweeter yess totally agree with the 5star comment..it shouldve been but we were shocked with the attitude of the reception and concierge..they probably had probelms ma3a nas mn gabil o 6ala3aw 7arathum 3alaina..